Here is the wedding cake that I made for my daughter's wedding. Each layer was suppose to be double layered cakes but the wedding guest count was very small so I made single layer cakes instead. The roses are also made of fondant but I elected to do them 1 petal at a time so they look more realistic. I make my own fondant and butter cream icings. I'm particular about my fondant and most "store bought" fondants just taste nasty. What do you guys think... do you think I have a chance of doing this full time? The cake looks wonderful. Very well done. Yes you could do this professional. You did a great job. But the question is now how does it taste? Here let me take that bottom piece and I will let you know. Then I will tell ya if you can do it full time. Kidding hun. Wonderful job. Kudos to you. Ahh the taste is great. That is what started this whole thing. I've always been known for my super moist cakes and the fondant that I make isn't as sweet as some others I've tasted. But hun you should know that "bottom piece" is 14" so you'd be eating cake for awile. Thank you very much for your comment. All good. I don't mind. Give me a 4liter jug of milk and I will go to her. Now you sound like my husband. He loves me baking cakes because you have to level them and the piece that you cut off has always been proclaimed as his. Just give him a glass of milk and he's all set. That is a cute cake. I have heard that fondant is hard to work with. I would certainly try to make a go of doing it as a job if I were you. There are plenty of people in this world who are willing to pay someone to do cakes for them. The cake is so beautiful. I like the color of the flowers. The look so real. I think you could do it full-time. I really hate the store bought cakes they always taste nasty. I think yours is more prettier than a store bought one anyday.. Thank you so much for the comment. We'll see what happens. 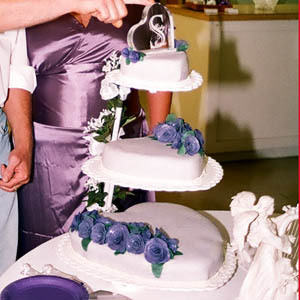 wow that is a very pretty wedding cake, I would be proud to have that cake at my wedding , you did a awesome job. you should really do it full time. you have what it takes. great job. Thank you very much for your comment. You guys make me feel great.